If you have versions 4.3 , 4.4 , or 4.5 , open the previous version of this article as a PDF . You're probably already familiar with the basic idea of filters. If you've ever filtered your e-mails or filtered data in a program like Microsoft Excel, you'll know that you can select a bunch of different criteria to see only the information that you're interested in. Our filter works the same way with a few extra bells and whistles. When you search for terms, we'll try to present your filter in the form of a sentence. Sort of like how you would tell a person to go and get some terms for you. We call this sentence the "filter description". This shows up in the main filter bar along with the other filter features. 1 This field pretty much does what it says. You can start typing here and you'll get suggestions only for terms that are included in the filter results. 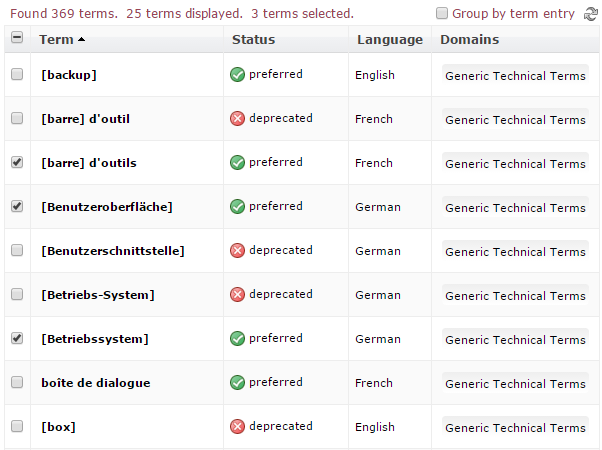 For example, suppose that you filter for terms in the domain "Technical Terms". You then search for a product name like "Acrolinx AwesomeThing". If the term "Acrolinx AwesomeThing" is in another domain like "branding", it wont come up in your search results because the filter is restricted to technical terms only. If you click Show all terms containing.. or Match pattern the term search is added to your filter. For example, suppose that you enter the search term "Acrolinx" and click Show all terms containing.. . The criteria "Show all terms with *Acrolinx*" is added to your filter description. To get rid of it, start typing another search and in the autocomplete menu, select Remove the term search from the filter . 2 Click to open the Filter Criteria window and add search criteria to your filter. 3 This is the filter description that we mentioned previously, but here's an extra tip: Do you notice those words underlined in bold? You can click those to change your criteria. 4 Click to see the available actions. Actions are what you want to do with your filter after you've finished creating or updating it. For example, you can save your filter and share it with other people. 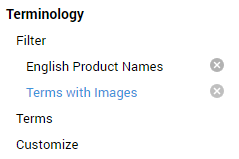 Acrolinx starts to create a filter for you when you search for a term pattern or click one of the categories on the Terminology page. Even the default page "Show all terms" is basically an empty filter. So all you have to do is start adding criteria. To add criteria to a filter, follow these steps. In the Filter Criteria window that appears, select your criteria and click Add . This immediately adds your criteria to the filter. Keep an eye on the filter description and notice how it changes when you keep adding criteria. If you have a lot of criteria the description can get quite complex, so make sure it's what you expected. When you're done, click OK to close the window. Term Filter terms by term name or part of a term name. You can use the wildcard character '*' or '%' multiple times, and in any part of the search string. 'multi*' to find all terms that begin with 'multi' such as "multi-byte", "multi-homed host"
'*ing' to find all terms that end with 'ing' such as "finding", "loading"
'*manag*' to find all terms which contain the string 'manag' such as "term management", "area manager"
Head Term Filter for terms which are, or are not, head terms. Filtering for head terms only enables you to see a list of distinct term entries. Term Entry ID Enter the term database ID of the head term to filter for all terms which belong to a specific term entry. Custom Fields Section The fields in the Custom Fields Section enable you to filter terms by the values of their custom fields. Use the first dropdown to select the custom field that you want to search within. The second field displays as a dropdown or text field depending on the data type of the custom field you have selected. In the text field which appears, enter your search text and include the wildcard character "*" if necessary. If you do not use wildcards, the search filter tries to match the entire contents of a field. In the dropdown, select the list item you want to search for. Click the "+" button to add list items. The filter interprets this search as an " AND " search. For example, suppose that you have a term that relates to multiple projects with internal codenames. You could filter for terms that belong to projects with the codenames "crystal bacon" AND "titanium cupcake". Select "project", select "crystal bacon", click Add . 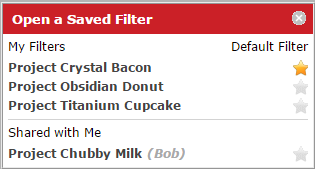 Remove "crystal bacon", select "titanium cupcake" and click Add again. Inflected Term Filter for terms based on whether they have the "check inflections" setting enabled. System Fields Section The fields in the System Fields Section enable you to filter terms by the values of their system fields. Select multiple list items to filter on more than one possible value. Has translation into Filter terms which have a translation into a particular language, or filter terms which have any kind of translation. Filter terms that were created or changed by a particular user. Filter terms that were created or changed in a specific time period. To see the time fields, click a date in the calendar popup. Enter the time in 24-hour format. Filter terms that were created or changed in a time period that is relative to today's date. Select today to see all terms that were created since 00:00 today. Select yesterday to see all terms that were created since 00:00 yesterday. Select in the last ... days and enter a number in the input field to see all terms that were created within a specific number calendar or days before the current date. This option also includes terms that were created today. Tip: When you open the Dashboard, the created on and changed on times are displayed relative to the time settings on your computer. Example: If you are in New Delhi and create the term 'test' at 2:30pm, the created on time for the same term appears as 4:00am to a user in New York. If users in both New Delhi and New York filter for terms created after 9:00am in the same day, only the users in New Delhi will see the term 'test' in the filter results. If you want to add new criteria to a filter, you can click Filter to open the Filter Criteria window. However, if you just want to change one of the existing criteria you can do it by editing the filter description. You can also negate or remove criteria in the same way. To change a filter by editing the filter description, follow these steps. Click on an underlined section of the filter description. For example, suppose that you've filtered for a project with the codename "crystal bacon" and you want to filter for another project instead. "Show all terms with a project field that contains "crystal bacon" and status Preferred ." In the filter description, you would click the text " a project field that contains "crystal bacon" "
In the dialog box that appears, select new values for the criteria and click OK .
For example, suppose that you want to change the project filter from "crystal bacon" to "titanium cupcake". Select "titanium cupcake" from the "project" dropdown and click OK . If you've filtered for a domain such as "widgets", you can click widgets in the filter description and click + to add more domains such as "sprockets" and "doohickeys". "Show all terms with domains widgets and sprockets and doohickeys . You can open a filter by navigating to Actions > Open a Saved Filter . What you might not immediately notice is that you can have several filters open at the same time. You can switch between open filters in the navigation menu. Each open filter is displayed as a menu item under Terminology > Filter . You can use the close buttons to close filters and remove the menu items from the navigation menu. If you navigate to Terminology > Filter , you'll get the last unsaved filter that you had open. When you open a filter, all matching terms are displayed in the search results table. You can customize the appearance of the search results table to reveal or hide information. When you save a filter, Acrolinx also saves any changes that you've made to the search results table as part of the filter. To choose what details appear in the search results, select Actions > Choose Columns... . Select the information that you want and click OK .
To change the order of the columns, drag and drop the columns to where you want them to be. You probably don't want to try this after drinking five espressos. You can also select group terms by term entry to see all terms that belong together. A term group displays all synonyms and translations. Each term group is displayed in a separate section of the search results table. This feature is especially useful if your terms usually have many synonyms and translations. If you group the terms by the term entry, you get a better overview of the terms that describe the same concept. When you save a filter, Acrolinx also remembers your selection for the Group by term entry option. Suppose that you're managing different lists of terms for different projects. You'll probably want to save those lists as filters and share them with other people who are working on the same projects. You can share your filters with anyone as long as they have a role that contains the "term edit" privilege. Open your filter and navigate to Actions > Change Filter Sharing... . In the window that appears, click the user IDs of the people who you want to share your filter with. You can also stop sharing a filter with someone by clicking their name in the Filter Recipients list. Not everyone can log in to the Dashboard. You might have freelance writers who occasionally use the Term Browser to look up official product names and terminology. No problem, you can share your filter with them too. Before you start sharing, make sure that you have a role with the privilege "Share filters with the Term Browser". To see your privileges, click Settings in the top-right section of the Dashboard. Open your filter and navigate to Actions > Share with Term Browser Users . If this menu item is disabled, it could be that you're trying to share someone else's filter. You can't share someone else's filter with the Term Browser, only a filter that you created. In the confirmation prompt that appears, select whether you want the filter to be the default filter that loads when people open the Term Browser. If you don't want to make it the default filter, just click OK without selecting anything. You can also stop sharing a filter with Term Browser users, select Actions > Stop Sharing with Term Browser Users list. You can update the criteria for a filter after you've opened it. You can do this with filters you've saved yourself and filters that other people have shared with you. If you change the search criteria of an active filter, an asterisk appears beside the name of the filter in the Navigation Menu to indicate that you haven't saved your changes. To update the filter you have open, just click OK without changing the filter name. To make a copy of one of your own filters, enter a new name and click OK . If you save a copy of a filter that someone has shared with you, Acrolinx will propose a new name. If you need to, update the name, then click OK .
You can only rename your own filters. You can't rename other people's filters. That would be asking for trouble. If you delete one of your own filters, it will disappear forever. You can delete someone else's shared filter, but don't worry, you're only deleting it from your list of saved filters. The person who shared the filter can still see it in their list of saved filters. However, if this hypothetical person is observant enough, they'll see that you're no longer in the list of recipients for that filter. So be careful not to hurt anyone's feelings. Sharing is caring. If you work with the same set of terms every day, you probably don't want to have to click around to open your favorite filter every time you start work. Acrolinx can do that for you. All you have to do is set your favorite filter as the default filter. For example, suppose that all your product releases have specific codenames, and you happen to be working on project "Crystal Bacon". You've got a filter for all the terms that relate to this project. You want to see it whenever you open the terminology section. To set that filter as the default filter, navigate to Actions > Open a Saved Filter... and click the little star next to the filter name so that it turns yellow. When you navigate to Terminology > Filter Acrolinx displays whatever filter you have set as your default filter. By the way, you don't have to stick to your own filters. You can also use someone else's shared filter as your default filter.